Humayun Ahmed is one of the most popular Bengali fiction writers of the 20th century. He is regarded as the best writer after the independence of Bangladesh. His writing books are easy description of event and simple language expression, so the books have no comparison. This great author was a novelist, short story writer, playwright and songwriter and the pioneer of modern Bengali science fiction. He wrote more then three hundred books, Jyochna and Jananir Galpo are the popular novels of his and the background of this novels are liberation war of Bangladesh. 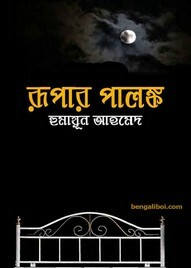 'Tomader Jony Bhalobasa' is one of the most popular science fiction book of his. Now I want to share an another famous book of his writing- 'Rupar Palanko' as pdf file. The pdf has 89 HQ pages, 4mb file size. Courtesy by boighar online.